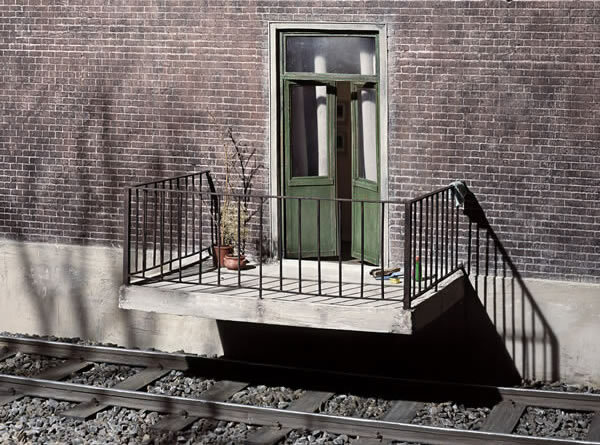 Frank Kunert uses miniature building and photography to create his Kleinen Welten (“Small Worlds”). Apart from their astounding detail, it is his tentatively surreal photography of these table top creations that demands close inspection. Some views are intended to instill poetic quality, others humor or silent darkness, he says. The worlds he constructs are mostly industrial grey and colored as if by an overcast sky, and unpeopled. Rather, a careful choice of architecture that defines its people, in a lucid state of altered reality. Kunert works on each miniature for many months before it is captured on film. Everything about the construction is meant for that moment of story creation. The intended punchline is word play or a subtle jab, he says. 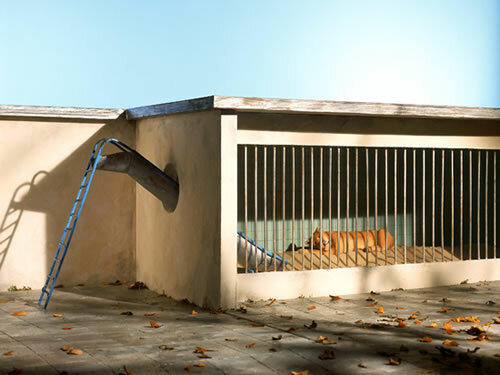 His work has been exhibited across Germany and in New York. i thought the fist one was really cool and that i like how he put part of the house where the train track was and the other one i couldnt make out but thought it was weird and intresting. I love this piece. Great idea. It could be real if the track was out of use, you know. I love this piece. It's great, at first I thought it was an illsion. But when I looked a little bit closer I thought maybe the artist wany=ted to trick you. I just really like it. I can't say I don't like it because I don't, I love it. This is amazing. I really like it. At first I was like "Is this an illsion?" But when I looked a little bit closer I realized when I saw the shadow the artist wanted to trick us. It's just a really good piece.